"What you've got here is clear evidence of the execution of unarmed combatants or civilians. It doesn't matter which they are, they're both prohibited under the Geneva Convention and they are both ranked as what we call a grave breach of the Geneva Convention so they are crimes in international law," Knowles told Channel-4. Evidence of mass extra-judicial killings continues to mount as Channel-4 and Human Rights Watch (HRW), the New York based rights watchdog, independently seek witnesses and relatives of the victims to obtain direct and circumstantial evidence of Sri Lanka's war crimes. Channel-4, after its own investigations, confirmed TamilNet's earlier statement that one of the women shown in the video has been identified by a close colleague and friend as the Tamil journalist, Isaipriya, and that Isaippiriyaa was a high profile member of the Tamil Tigers – but her role was as a journalist rather than a direct fighter as a result of a heart condition. "She never carried a gun and her physical condition did not permit her to go to the battlefield. She always had either a camera, a pen or a notepad," Channel-4 said, adding, "[i]n two images, Isaipriya can be seen with another woman lying in a trench. It is unclear if she is alive or dead, but the photographs' date stamps are 18 May 2009 and it appears that the hands of both women are tied." Human Rights Watch (HRW) said that the "new evidence links the Sri Lankan army's 53 Division to the alleged summary execution of prisoners...."
"This horrific new evidence demonstrates graphically that the Sri Lankan army engaged in summary executions of prisoners during the final days of fighting in May 2009," said Brad Adams, Asia director at Human Rights Watch. "The government's failure to investigate these serious war crimes in the face of overwhelming evidence shows the need for an independent, international investigation," Adams added. 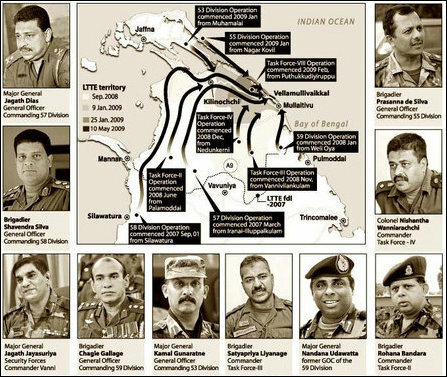 One of the alleged accused of the war crimes, Major General Kamal Gunaratne, first commanded the 55 Division in Jaffna and later was appointed as the GOC of the 53 Division. His division captured Muhamalai, Pallai, Soranpattu and Elephant Pass. His Division was moved to Mankulam and later deployed in the battle to capture Puthukudiyirippu. It was his troops who captured the Eastern edge of the Nanthikadal lagoon along with the Task Force VIII troops. In the final battle his divisions fought in the banks of the Nanthikadal lagoon in Vellamulivaikkal. Julian Knowles is a leading junior in crime, extradition, public law, and European and international human rights law. He also has wide experience of both trial and appeal work and has been described as ‘demonstrating all-round brilliance’ according the website of Matrix. 01.12.10 Woman victim in Channel-4 video identified as Journalist Isa..